In order to get highly clear line generation in various machinery processing work fields, it would be quite wonderful experience for users to use a high brightness 532nm green line laser module. It is a very advanced 532nm green DPSS laser tech applied laser line measuring tool. On basis of excellent equipment with metal heat sink cooling system and APC driving circuit inside its durable aluminum alloy housing tube, this laser line generator would always make sure of improving laser beam stability, and then assuring highly clear and accurate line generation in distance efficiently. 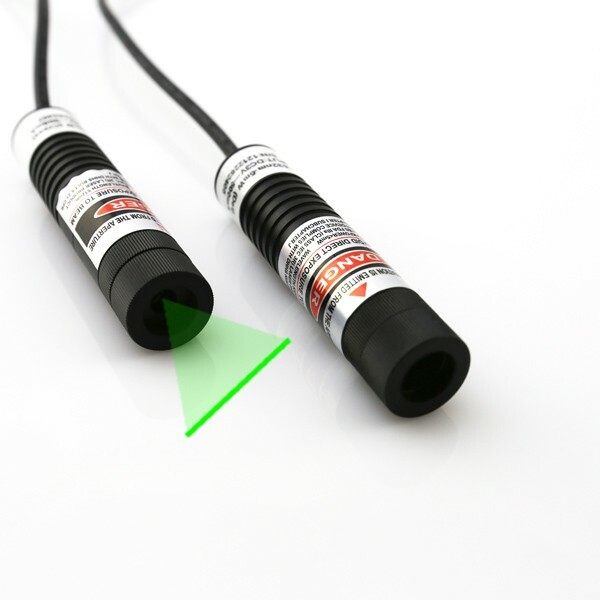 This 532nm green line laser module gets constant electric power source from DC input power supply. It is keeping work with external DC input power supply. The specially designed AC/DC adapter is accepting wide range electric current within 100V to 240V, and then converting 3V or 4.2V DC power source. When it is getting wide range output power of 5mW to 100mW, it is not only generating highly visible and clear green laser beam at several miles far away, but also assuring super clear green reference line generation within the maximum work distance of 25 meters. Any type of visible laser light cannot be observed under sunlight, users should just pay attention to real working environments. A correct output power and optic lens degree made green laser line generator will make sure of clear enough line projection in distance. Whatever kind of working surface, no matter glass coated lens or separate crystal lens it is equipped, 532nm green line laser module is generating high linear quality green reference line in distance. It is able to work with selectable optic lens degree of 10 degree to 110 degree, and then generate different line length from 0.5 meter to 6 meters. It is not adjustable focus, however, after very simple roast of laser beam aperture, green alignment laser line thickness can be freely adjusted, and then achieving the most accurate line generation in distance easily. In those of quite harsh working environments, this industrial stabilized 532nm green line laser module gets excellent design with aircraft used aluminum alloy housing and high temperature resistance designed DC power source. The genuine green alignment laser line targeting is bearing quite wide range operating temperature, and then obtaining highly stable line generation under various kinds of complex working environments. According to proper selection of 532nm wavelength preventing laser safety glasses and proper installation on correct position, this alignment laser would always make sure of the clearest line generation in all occasions perfectly.